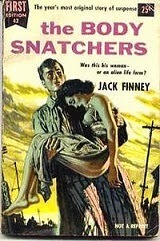 A World Fantasy Award for Life Achievement recipient, Finney was a science fiction and thriller author, best known for his 1955 novel The Body Snatchers, which has been adapted to film at least four times. • "After the Movies" Suspense. • "I'm Scared" Sci-fi Radio. 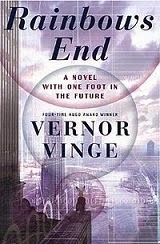 A five time Hugo Award winner, with multiple other award nominations and wins, Vinge is a science fiction author, whose works are frequently focused heavily on a hypothetical upcoming "singularity." Only one of his works is freely available as of this posting. His homepage is here. —"The Coming Technological Singularity" 1993. • At Baen: "The Ungoverned" Science Fiction. "Al's Protection Racket operated out of Manhattan, Kansas. Despite the name, it was a small, insurance-oriented police service with about 20,000 customers, all within 100 kilometers of the main ship. But apparently "Al" was some kind of humorist: His ads had a gangster motif with his cops dressed like 20th century hoodlums. Wil Brierson guessed that it was all part of the nostalgia thing. Even the Michigan State Police—Wil's outfit—capitalized on the public's feeling of trust for old names, old traditions."